Saitown Vietnamese Eatery and Sizzle & Crunch opened four blocks from each other early this year, both with a Chipotle-esque Vietnamese concept. How do they compare? 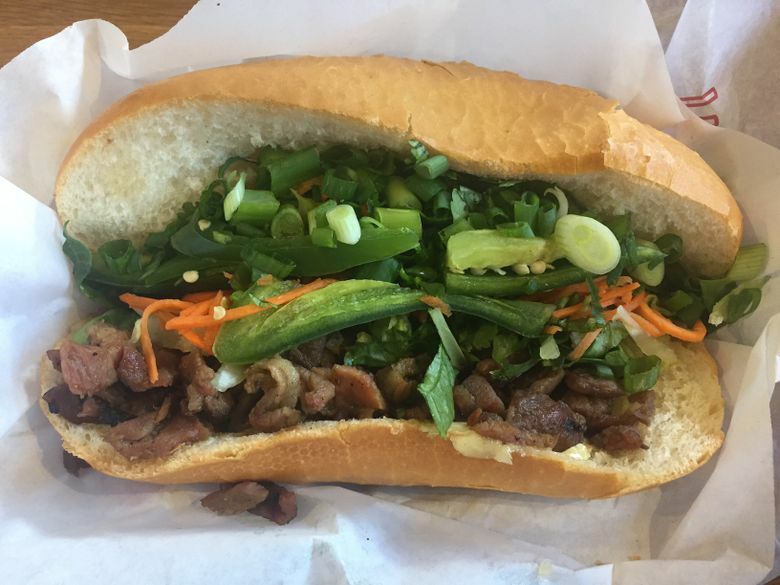 In February, Saitown Vietnamese Eatery opened on The Ave, hawking its fast-casual concept of building your own bowl (rice, noodle and salad) and banh mi. The Saitown folks likely thought they were ahead of this game, except four blocks south, the Vietnamese joint Sizzle & Crunch opened about the same time, with a business model that looks cribbed from Chipotle. So how do they compare? How to order: Saitown: It’s a three-step process: pick baguette, vermicelli noodle, rice or salad; select which pickled root veggies, greens and herbs you want with the bowl or bread; then pick a protein or vegetarian topping. The food is delivered to your seat. 1313 N.E. 42nd St., Seattle; 11 a.m.-9 p.m. Monday-Friday, noon-9 p.m. Saturday, closed Sunday (206-547-2723 and on Facebook). Sizzle & Crunch: The server behind the glass-pane counter assembles your bowl or banh mi in front of you. Don’t miss: At Saitown, order the “nem nuong,” or, as it’s called on the American menu, grilled pork meatballs, a misnomer since they’re cut into rectangles and have a sausage-like texture, dense and meaty with a snappy bite. It’s best with rice, or get it rolled with rice paper and lettuce. At Sizzle & Crunch, order the grilled pork shoulder, served in little pieces, the edges charred. They taste smoky and sweet from being caramelized with fish sauce over an open flame. Also stellar are the deli-thin slices of braised pork belly that taste a bit like porchetta. Both work well in a banh mi or rice bowl. Pros: It has more vegetarian options (satay eggplant, garlic mushroom and lemon grass tofu). There’s also six other meat and seafood toppings. Saitown offers a 10 percent discount from 10:30 a.m.-noon and a discounted happy-hour menu from 3-5 p.m. and 7 p.m.-closing. Cons: The baguette tasted like day-old bread, hard and dry. Pros: Between the two spots, this one is better overall. Meats, from beef briskets to pork three ways (pork chop, pork belly and grilled pork shoulder), are well-seasoned. The banh mis are toasted and fresh. It’s one of the better cheap eats to debut in the U District in the past two years. 4725 University Way N.E., Seattle; 10:30 a.m.- 9 p.m. Monday-Thursday, 10:30 a.m.-10 p.m. Friday-Saturday, noon- 8 p.m. Sunday (206-456-7192, saitownseattle.com). Cons: Sizzle offers only tofu as a vegetarian option. “The BB Special Banh Mi” is a gut bomb, overstuffed with pork belly, cold cuts, pâté, mayo, a fried egg, tomato, scallion, cucumber, jalapeño, cilantro and scallion aioli, but there isn’t enough acidity to make it go down easy. Prices: Banh mis cost about $6 at both places. At Saitown, rice and salad bowls range around $7; Sizzle & Crunch around $6-$7. Prices are comparable. 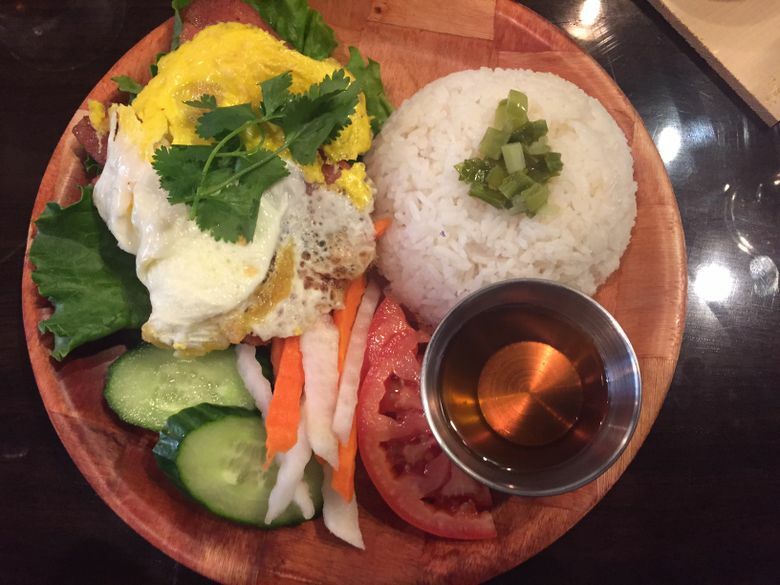 At both places, the bowls are a better deal than the banh mis. Sizzle’s portions look to be slightly larger, but both places offer copious amounts of meat in the rice bowls. You’ll leave full at either for less than $10.